Warning signs:An aerial view of an unnamed Indonesian island in Riau province. Many of Indonesia’s islands may be swallowed up by the sea if world leaders fail to find a way to halt rising sea levels. Jakarta: Many of Indonesia’s islands may be swallowed up by the sea if world leaders fail to find a way to halt rising sea levels at this week’s climate change conference in Bali. Doomsday predictors take this dire warning by Indonesian scientists a step further and predict that by 2035, the Indonesian capital’s airport in Jakarta will be flooded by sea water and rendered useless; and by 2080, the tide will be lapping at the steps of Jakarta’s imposing Dutch-era presidential palace, which is located about 10km inland. The Bali conference hopes to find a successor to the Kyoto Protocol, which expires in 2012, on cutting climate-warming carbon emissions. With more than 17,000 islands, many at risk of being washed away, Indonesians are anxious to see an agreement, which would be quickly implemented and keep the rising seas at bay. Just last week, tides burst through sea walls, cutting a key road to Jakarta’s international airport until officials were able to reinforce coastal barricades. “Island states are very vulnerable to sea level rise and very vulnerable to storms," said Nicholas Stern, author of an acclaimed report on climate change. “Indonesia...is particularly vulnerable," Stern said. Even large islands are at risk as global warming might shrink their land mass, forcing coastal communities out of their homes and depriving millions of a livelihood. The island worst hit would be Java, which accounts for more than half of Indonesia’s 226 million people. Here rising sea levels would swamp three of the island’s biggest cities near the coast—Jakarta, Surabaya and Semarang—destroying industrial plants and infrastructure. “Tens of millions of people would have to move out of their homes. There is no way this will happen without conflict," Indonesian environment minister Rachmat Witoelar said recently. “The cost would be very high. Imagine, it’s not just about building better infrastructure, but we’d have to relocate people and change the way people live," added Witoelar, who has said that Indonesia could lose 2,000 of its islands by 2030 if sea levels continue to rise. Environmentalists say this week’s climate change meeting in Bali will be crunch time for threatened coastlines and islands as delegates from nearly 190 countries meet to hammer out a new treaty on global warming. Several small island nations, including Singapore, Fiji, Kiribati, Tuvalu and Caribbean countries have raised the alarm over rising sea levels which could wipe them off the map. The Maldives, a cluster of 1,200 islands renowned for its luxury resorts, has asked the international community to address climate change so it does not sink into a watery grave. As per a United Nations climate report, temperatures are likely to rise by between 1.1 degree Celsius and 6.4 degrees Celsius, and sea levels by between 18cm and 59cm this century. Under current greenhouse gas emission levels, Indonesia could lose about 400,000 sq. km of land mass by 2080, including about 10% of Papua, and 5% of both Java and Sumatra on the northern coastlines, Armi Susandi, a meteorologist at the Bandung Institute of Technology, said. Indonesia,?the world’s fourth most populous country, has faced intense pressure over agricultural land for decades. Susandi, who has researched the impact of climate change on Indonesia, estimated sea levels would rise by an average of 0.5cm a year until 2080, while the submersion rate in Jakarta, which lies just above sea level, would be higher at 0.87cm a year. A study by the UK-based International Institute for Economy and Development said at least eight out of 92 of the outermost small islands, which make up the country’s borders, are vulnerable. Less than half of Indonesia’s islands are inhabited and many are not even named. 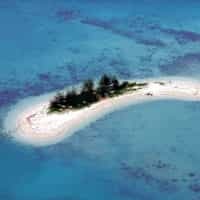 Now, the authorities are hastily counting the coral-fringed islands that span a distance of 5,000km—the equivalent of going from Ireland to Iran, before it is too late.